An output source is nothing more than an association between InfoSewerH20Map Sewer and the output (.out) file created from a simulation run. InfoSewerH20Map Sewer refers to model runs as output sources, whether they be *active*.Steady or ScenarioX.Design, every model run is affiliated to an external output file by its “output source” name. From the icons at the top of the Run Manager, the user has full control over the associations between an output source in InfoSewerH20Map Sewer and its external output file. If the user has created and modeled four custom scenarios, the output for each scenario will be made available for report and graphing purposes under the Output Report Manager(under the All Output Sources box). If the user then wanted to add (load) another model run performed by someone else (perhaps multiple people working on the same project file), then by clicking on the Load Output Source icon, the user can assign an external output file to a user-defined (internal) output source. Once this is done, the newly imported output source can now be compared with other previously run “output source” models (via graphs and reports). Load (Create) an Output Source? Scenario – This option is only available if the user has previously removed an existing output source via the “Remove Output Source” icon. By selecting this option, the user can reinitialize a previously run model without having to re-run a scenario simulation. External Output File – This option is used to assign an existing .out file to a user specified output source “name” at the top of the dialog box. Once the link is established, the user can now compare existing simulation data with the newly imported data. To remove an output source from the current H2OMAP Sewer project, select either the Remove Output Source or the Remove All Output Sources icon. The first will remove the currently selected output source as shown in the upper left hand corner of the Run Manager while the latter will remove all output sources. Click here to view these icons. To rename an output source, from the Run Manager, select the Output Source Name and then click on the Edit Name icon to rename the output source. To save an output file, the user must first make active the scenario for which an output is desired. Once a scenario is active, go to the Run Manager and run the *active* model (steady state, design, or EPS). After the model has run, select the Save icon to save the model run to a file name other than the default. Output source data (simulation results) for the most recently completed steady state analysis simulation. Output source data (simulation results) for the most recently completed steady state design simulation. Output source data (simulation results) for the most recently completed extended period simulation. When assigning an output file to an output source, the data type need to match. In other words, a “steady” hydraulic run cannot be imported into an EPS simulation. When you switch to another scenario, output sources for standard simulations are immediately available as described above. As you run a given simulation, the output source name for that simulation is *Active*.Steady. The previous *Active* simulation is converted to a user-defined source and renamed based on the active scenario at the time that simulation was performed. 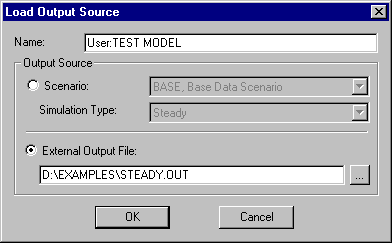 For example, if the previous standard simulation was based on your scenario named “CUSTOM1”, then the output source from the previous run is renamed CUSTOM1:Steady. Once a scenario is run, the output source will always be tied to the default output file unless the user manually re-assigns that relationship.